Cardfight!! Online is the official online digital implementation of the famed collectible card game Cardfight!! Vanguard coming soon to Windows PCs. Cardfight!! 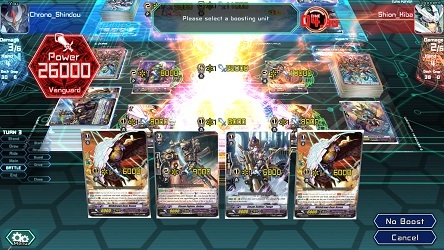 Vanguard features hands down some of the most vivid and detailed art of any ccg or advanced card game and by the looks of the screenshots and other media that has been released it appears as if the developers are putting a lot into the title. The game's battle system is known to be one of the best when it comes to tactical strategy and balance. A closed beta for the game was recently announced in a Facebook Post linking back to the Cardfight!! Online site but no signup form is available there as of this post. There is also an official animated series based around the game's universe that can be watched on the Cardfight!! Vanguard YouTube Channel or from several other sources linked here on the official Cardfight!! Vanguard site. The initial version of the game will be released on Steam and has already passed Steam's Greenlight process. Although many of the specific details regarding the forthcoming title have not yet been released, some information has been disseminated through various Q & A sessions on the official Cardfight!! Vanguard Twitter and elsewhere which are indexed here. The registration for the Cardfight!! Online closed beta has begun! Registration will be open January 13th through January 19th 19:00 PST. Those selected will be notified via email and sent a steam key for the beta along with other pertinent information. Good luck to everyone who is signing up and I hope to see you on the battlefields of Kray soon! I have been working on a subreddit for the forthcoming game Cardfight!! Online over the last couple of weeks. The subreddit is a place for breaking news, information, faqs, topical discussions, theory crafting decks and indexing resource links related to the game. A lot of customization has occurred on the subreddit both functional and cosmetic. Currently we are working on integrating a bot that will populate a list of the currently live top 10 (most viewed) streams of the game, as well as generating a report of all active streamers at intervals of around 30 minutes. We look for the subreddit to become more active once the closed beta for the game begins, and when the actual public release occurs. In the mean time while we wait to see if we were selected for the closed beta, take a look around. Feel free to make suggestions, get an early look at the game's subreddit, and subscribe if you plan on following the game and are so inclined. For more information about Cardfight!! Online see the original post, or the What We Know So Far (FAQ) post on the subreddit.